A perfect storm is forming for artists who have an interest in storytelling. 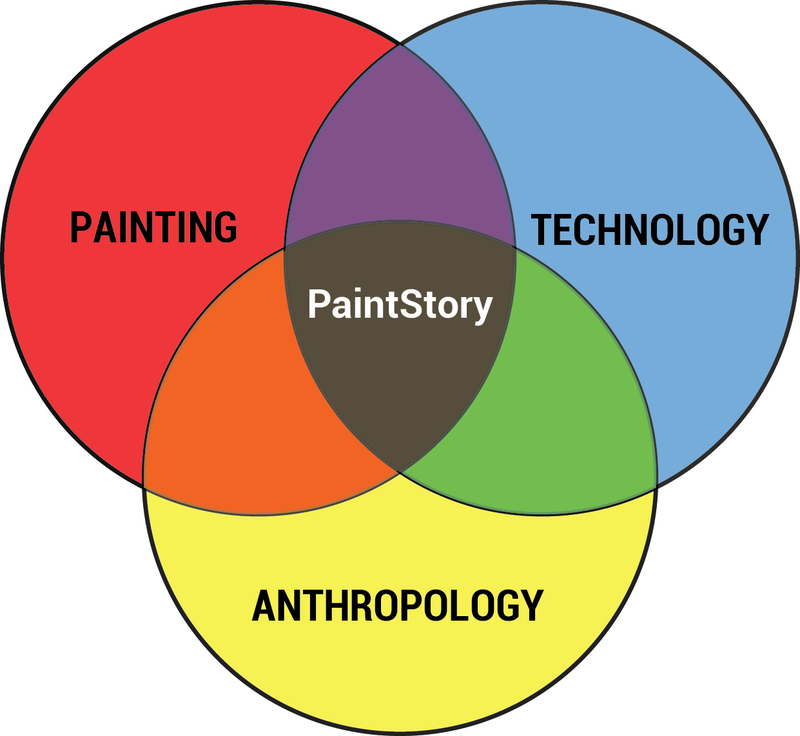 Introducing the PaintStory as a social media content strategy. PAINTING—TECHNOLOGY—ANTHROPOLOGY are colliding to give brilliant new opportunities. Traditionally people come to painting as a hobby. It gives them a way to deal with the stress of life and is a great pleasure. Over time their skills improve and the subject matter matures. The first public exhibition is a milestone in an artist’s career and often signifies their intention to become professional. To sell a painting affirms the value of the artist’s skill, but also of the ideas they are trying to express in their work. As a professional, an artist is concerned with what people will buy, but like happiness this cannot be aimed for directly. Instead, an artist will seek to build their reputation (what they stand for or are trying to achieve artistically) rather than what they produce. The “lucky” ones get discovered. Their name is made and they can set their own price. This is the artist’s holy grale. In the last 10 years artists are using the web and social media to increase their exposure and enhance their chances of being discovered. But with everyone doing the same thing, the artist’s story has to be pretty special to stand out. Artists want to be discovered specifically by the art industry (investors, critics, galleries, agents). But this involves a lot more than engaging an agent, holding exhibitions or attending gala industry events. People who invest in and promote art want to know it has long term cultural value. Meaning: this artwork will be valued by society in the future. Many artists work in isolation, so they can only tell their own personal story. Sometimes solo artists like these may be lucky if—due to their heritage and circumstances—their story is of great interest to many others. But this is rarely the case, so discovery is unlikely and the solo artist feels disheartened and trapped in obscurity. From this perspective, the risk of becoming a professional artist is immense. Meanwhile, a lot is going on in the world. These are interesting times. By looking out into the world, like an anthropologist, bigger stories than our own are available, that will be of long term interest to the people of the future. Finding these types of human stories can inspire an artist in their work and give their work cultural relevance. Giving the artist a fast track to reputation building and discovery. A story expressed in painted pictures is profoundly touching. No other medium has the power to instantly transport the viewer into another world of experience. This is why art is valued above all other cultural artefacts. Unlike all other media a painting provides the most personal experience. Every time you view a painting it has new meaning, based upon your maturing understanding of life. Hence, the meaning of the painting changes with the viewer. With every view. And finding meaning in the painting can change the viewer. There is a fledgling movement of artists taking video cameras with them to film as they paint en plein air. Here we are transported to a place of importance to this artist while they try to capture the meaning in their work. This is anthropology in action. Thoughts on Painting by Artist Tom Hughes in the UK. The more sophisticated artists describe their thinking as they work, so that viewers can know what they are trying to capture. The light, the subject, the challenges. In a world of counterfeits this is an excellent way of claiming ownership and proving authenticity for the artist and for the collector. But the real value is in the story. Why did the artist go to that place? Why is it significant? Right now, not many artists are asking this question. They continue to go to places that are spectacular, beautiful, interesting, but they can go so much further. Beyond the fortunes of the artist this type of artistic production provides real value to the community. Through this medium the community that the artist has entered has a chance to tell it’s story. To raise its issues and record its memories. This is why the artist will be embraced and promoted. But the artist has to be objective and able to hear what is being told. And then to paint it into history. In 2016 a group of Victorian artists did this. They went to places along the route taken by the Chinese miners who walked 440 km from Robe to the goldfields of Victoria in 1857. These artists looked into landscapes that have been painted a thousand times before and found new meaning. Within 6 months an exhibition was created and that collection will travel around the world. Finally, in terms of financial value: artworks such as these (that communicate such powerful human stories) form part of the cultural world that people will pay to see. Often they will travel to view the work which is enhancing art tourism. And having seen it will want to own it—then the artist may finally reap their reward. Here is the birth of the PaintStory. A production that incorporates video, showing the painting in progress and telling the associated human story of interest. If released online these offerings may greatly assist the artist of the future to advance their artistic career.